it was springy and cheerful, so I wanted to use it to make Melanie a card to send to her in Chicago. I paper pieced the tulips with my Cricut using Walk in the Garden cartridge. 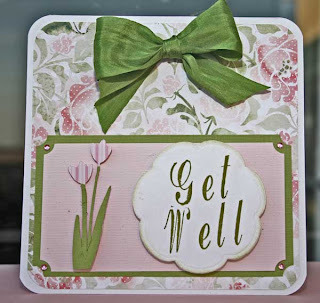 The Get Well was stamped with the upper and lower case of Times Roman and then cut using the Blossom Spellbinder Nestie. I would like to have made a double bow, but I didn't have enough ribbon. It takes about 24 inches and I was short. Sharon Johnson's Bow Easy makes a quick and easy job of making bows. Beautiful card! I'm sure Mel will LOVE it! I'm so very happy she is making progress. The love of her family and the prayers of many will pull her through. What a pretty card. I received my order from your store today, and as usual everything was packaged beautifully and the box arrived almost overnight! Thanks for all you do. I gave your Glue Glider and the store a shout out on my blog today. I will order from you again soon.